Talwalkars Better Value Fitness Ltd (BSE: 533200, NSE: TALWALKARS) counter on Wednesday witnessed a significant buy of 2.51 lakh shares by the FII, American Funds Insurance, which amounts to around 1.01% of the total shares in the company. This significant buy was undertaken by American Funds in NSE. This is the second time within the last 10 months, that a Capital Group fund has invested in Talwalkars. Earlier, on May 10th 2011, Small Cap World Fund Inc belonging to American Funds’ parent had bought 1.88 lakh shares or 0.78% of Talwalkars at a price of Rs. 226.04 a share. By the end of June quarter, Small Cap World Fund had emerged as the third largest non-promoter share holder in Talwalkars holding 14.46 lakh shares or 6%, which revealed that Capital Group had done many other smaller unidentified buys in the April-May-June quarter. In India, buys/sells are identified only if they are at least 0.50% of the total shares in the company. Capital Group was only behind Talwalkars’ earliest backers like noted academician-investor Shivanand Mankekar and family, and its largest investor, Reliance Capital Trustee Company. Wednesday’s buy by American Funds was at Rs. 159.50, almost 30% lower than their identified buy in May, due to the correction in the scrip. Interestingly, on Wednesday, there were no identifiable institutional sellers or promoters, as counterparties to the massive buy in Talwalkars, which means that the significant purchase was picked up by American Funds from the wider market. The same was the case during Capital Group’s May 2011 buy into Talwalkars. The promoter group of Talwalkars Better Value Fitness Ltd holds nearly 60% stake in the company, which is reasonable and healthy by Indian standards. Ever since the June quarter, Capital Group’s stake had remained steady at 6%. 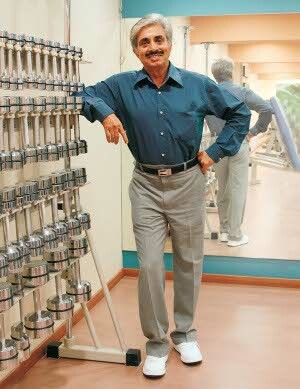 Talwalkars Better Value Fitness Ltd, is a leading India-based chain of health centres, founded by fitness entrepreneur Madhukar Vishnu Talwalkar. It has 114 health clubs across 61 cities in the country, on a consolidated basis, with over 1,20,000 customers referred to as its members. A pioneer in the country's emerging organized fitness field, Talwalkars delivers expert advice, personalised supervision, and a result-oriented approach. Facilities at a typical Talwalkars centre include cardio facility, aerobics, strength training, weight gain, weight loss, massage, steam / sauna, diet & nutrition counseling, juice bar etc. American Funds is a leading international asset management company specializing in mutual funds. A part of the Los Angeles based financial conglomerate, Capital Group Companies, it has nearly $1 trillion in AUM and over 5 crore shareholder accounts, and is often estimated as the world’s third largest asset manager. American Funds’ Assets Under Management is roughly equivalent to the total market capitalization of all listed companies in India. Roughly a third of its AUM is invested outside USA, making it one of the largest international institutional investors. In India, American Funds is registered as an FII account, American Funds Insurance Series, which has 11 FII sub-accounts dedicated for their various funds. On the fundamental side, Talwalkars has come up with a reasonable consolidated performance in the fiscal year-to-date or nine-monthly results, with revenues growing by over 30% and net profits growing by nearly 40%, both on a year-on-year basis. But the high expectation set in Q2 has been quashed in the recently announced Q3 numbers, with consolidated performance – both topline and bottomline - falling back to the lackluster numbers of Q1. Consolidated net profit margin (NPM) now stands at 9.05%. Though the QoQ fall between Q2 and Q3 may appear large due to the higher base formed in Q2, what is more troubling is that consolidated operating profit margin (OPM) has fallen from 42.28% to 35.51%, signaling that though Talwalkars is still growing year-on-year, there is pressure on both volumes and margins now. The company has since then clarified that the QoQ dip was due to the festive season, and that it hopes to maintain OPM at 40% at least, in FY’12. During the market correction of 2011, and also due to its weak Q1 numbers on a QoQ basis, Talwalkars stock had corrected steeply from a high of Rs. 267 on 30th June to a 52-Week Low of Rs. 108 on 20th December – a loss of nearly 60% in less than six months. Talwalkars has also never regained its post-IPO high of Rs. 305.80 in December of FY’11, which still reigns as its all-time high. The stock had participated in the recent recovery rally in the market, gaining almost 56% from its year-to-date lows. It remains to be seen what would be the call other large investors in Talwalkars take after Wednesday’s buy by American Funds. One big investors in the counter, apart from Reliance Capital and Shivanand Mankekar, is Rising India Focus Fund. Talwalkars has reasonable institutional participation of 20%, with both FIIs and DIIs holding around 10% each. Talwalkars closed Wednesday’s trade in NSE up by 4.66%. On Thursday, it opened only slightly up, but is now trading up by 1% in a weak Indian market.